The Veritas Backup Exec 20.1 Administration training course is a 5-day instructor-led virtual classroom which includes both lecture and hands-on experience. This Symantec/Veritas training course covers how to back up and restore data, configure storage devices, manage media, manage and maintain the Backup Exec environment. During the Veritas Backup Exec 20.1 Administration training course, students also learn how to configure and work with various Backup Exec Agents, which protect applications like Microsoft Exchange, Microsoft SharePoint, and Microsoft SQL. The Veritas Backup Exec 20.1 Administration training course also covers the Virtual Environment Agents and the Deduplication Option. Describe the basic functionality of Veritas Backup Exec 20.1. Describe the basic architecture of Veritas Backup Exec 20.1. Install and upgrade to Veritas Backup Exec 20.1. Manage devices and media used by Backup Exec. Set backup settings and methods. Work with the Database Encryption Key. Install the SDR disk creation wizard, create an SDR disk imagen and recover a server with SDR. Backup a physical machine and convert to virtual based on a schedule. Install, configure, and manage the Veritas Backup Exec Central Admin Server Option. Protect remote servers using the appropriate Remote Agent. Install, configure, and work with the Agent for Windows and the Agent for Linux and Agent for Mac. List the supported virtual conversion configurations. Configure Veritas Backup Exec Deduplication Storage. Veritas Backup Exec 20.1 Administration training course is designed for system administrators, system engineers, technical support personnel, systems professionals, consultants, network managers, network administrators, backup administrators, backup operators, and others who are responsible for installing, configuring, and day-to-day management of Backup Exec 15 in a variety of network environments, and who are responsible for troubleshooting and tuning the performance of this product in the enterprise environment. Before attending the Veritas Backup Exec 20.1 Administration training course, you must have basic working knowledge of administration and configuration of the Windows Server 2008 and Windows Server 2012 platforms. You must also have experience configuring server software and hardware. Basic working knowledge of domain security and experience with Active Directory and Windows Server 2008 and Windows Server 2012 are recommended. 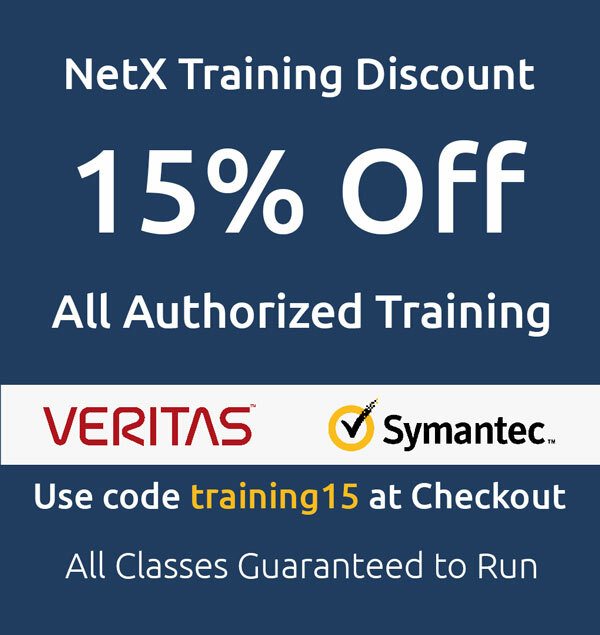 This Veritas BackUp Exec training course includes practical exercises and labs using your own network by means of virtual computers enabling you to learn and fine tune the skills required to be successful in your working environment. If you would like a quote on multiple training courses, add them to the cart and print the Quote from the Cart. Call: 609-298-9118 | 1-866-638-9462 for more information.